Being a tourist in Copenhagen it is easy to visit Roskilde too and anybody having interest in history will find it worth a visit. 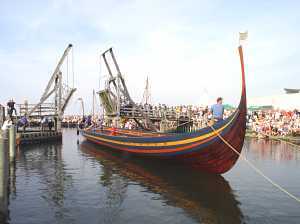 Roskilde has two main tourist attractions: The Roskilde Cathedral and the Viking Ship Museum. They are placed close to each other and it is easy to visit both of them on a day trip from Copenhagen. The Roskilde Cathedral is considered to be founded by the Viking king Harold Bluetooth in the late 9th century and in the last 600 years it has been first choice when royals were to be buried. The church contains 39 kings and queens among them Harold Bluetooth. Every year the church is visited by 150.000 people. Among other attractions near Roskilde is the archaeological Lejre Research Centre placed ten kilometres from Roskilde. 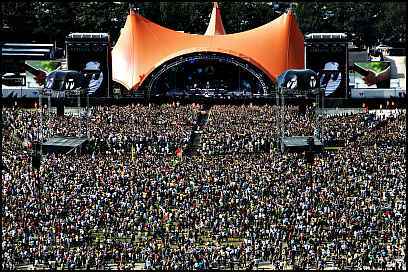 Every year in July the Roskilde Festival takes place in Roskilde. The largest music festival in Northern Europe. Since 1971 it has been attracting young people from whole Europe to hear leading rhythmic orchestras from all over the World. Being a tourist in Copenhagen it is easy to go to Roskilde. The best way is to use the train. Several times every hour trains are leaving Copenhagen Central Station for Roskilde. The trip lasts less than half an hour depending on the connection type. From the station it is walking distance (10 minutes) to Roskilde Cathedral which is placed near the central place of Roskilde "Stændertorvet". It is very easy to find and even if you get lost, you can ask anyone. They all will be able to tell you the way to the cathedral. 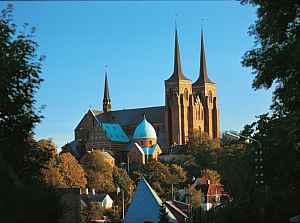 From Roskilde Cathedral you can walk to the harbour to see the Viking Ship Museum (less than 15 minutes). If you are interested in history you should calculate at least an hour for each attraction - better more. Roskilde is a nice town with a small but pleasant shopping street. In nice weather it is easy to use more time to enjoy the town and the harbour.